Sometimes it may not be possible to take time out for a weekend away or a retreat. Or it may not be your thing. We are busy right now developing a range of video based trainings for you to take at your own pace. In addition you get access to our members only forums and extra support through our webinars and conference calls. 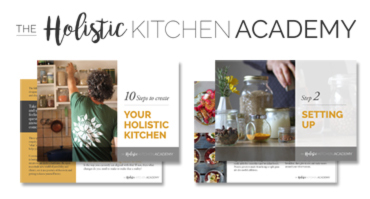 The Holistic Kitchen video trainings are coming soon. Please bear with us, as we are more at home in the kitchen than on the computer or film making!